In my opinion, Tagzania is one of the best mapping mashups out there. There's a similar service out there getting a lot of media attention called Platial (see articles about it at the NYTimes and recently National Geographic). 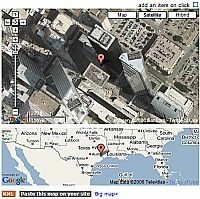 But, Tagzania is a much more powerful tool, and it supports Google Earth. In a nutshell, Tagzania allows you to easily create placemark push-pins with descriptions on a Google Map. More importantly, it lets you tag the placemarks with any tags (words) you want. You can view your own, or view any other placemarks with those tags. You can also simply perform a search. When viewing locations, you have a choice to use the default Google Maps, or you can view that location at any of a number of other mapping choices such as: Yahoo Maps, Windows Live Local, Multimap, Mapquest, and more. Tagzania shows you any nearby tagged locations which lets you explore nearby interesting places. Here is an example of what Tagzania can do. Check out this Tagzania tag for 'Escher', which in this case is referring to the odd way different aerial photos of downtown areas effect the ways buildings look (see explanation). You can start playing with it now and probably quickly find the Google Earth connection, but continue reading for more detail and examples. Tagzania's Google Earth integration is simple, yet elegant. For any tagged location, or collection of locations, you get a KML icon. That KML icon isn't just a KML file, but is really a network link KML file. This means you can save the network link and anytime someone ads a tagged location with that tag you will see the update in Google Earth. 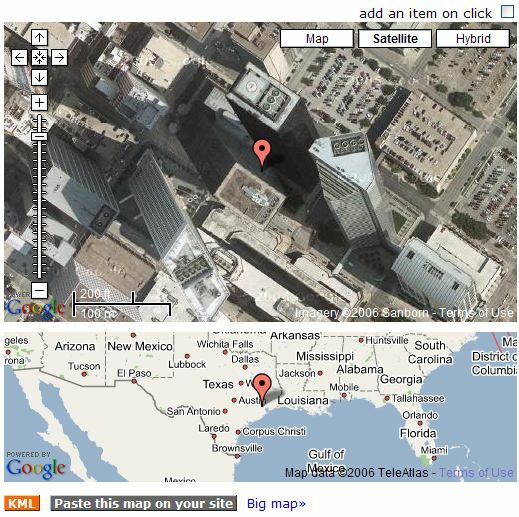 Using Tagzania you can simultaneously have a Google Maps mashup of your placemark collection and an auto-updating Google Earth collection. Not only that, you can get an RSS feed so you know when new items have been added! And, now load the same map in Google Earth . You may notice that the URLs for Tagzania tags are really simple. This makes it easy for you to send placemark collections on a given topic in both Google Maps or Google Earth form. And people are just one click away to almost any other map as well. Stefan Geens of OgleEarth is a big fan of Tagzania as well and he wrote enthusiastically about it last summer when they first supported Google Earth. KML files of single locations are one-time downloads, not subscriptions. After downloading, you may choose to keep the location on your Google Earth instance or not, but the information will not be linked to Tagzania on the net. If that location's owner deletes that item, it will be still on your client application.